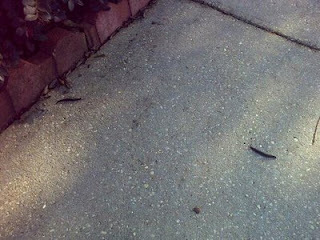 [LAPSE... brain dead]: Invasion of the slugs! See? I TOLD you they are planning an invasion .. Two of them this morning, and look what direction they are heading... Not toward the yard, but toward the house! Prepare now, the slugs are coming.. The slugs are coming! Seriously, though, as weird as the invasion of the slugs might be, there is another coming that you'd better be ready for; His name is Jesus. He came once already to prepare us... Next time, you'd best be ready and not caught off guard. For more info check out a copy of His story, known as the Bible. You can find one at a bookstore or a church if you don't already have a copy. Ok, so my tie-ins aren't quite as good as Dean's... Visit www.deanlusk.com for more.